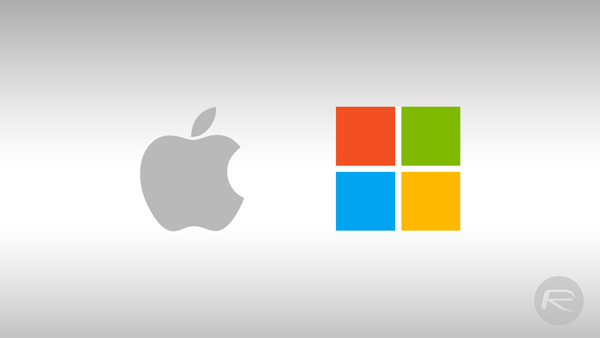 Microsoft has today added to its ever growing stable of iPhone apps, launching a new email app for Apple’s smartphone, called Send. Joining Outlook as a Microsoft-branded iPhone email app, Send is available to download for free from the App Store today, though you will have to be in the United States or Canada in order to get your hands on it – Microsoft is keen to get the ball rolling slowly to kick things off, it seems. If you do live in the right country and decide to give Send a try, you will notice that it is absolutely nothing like Outlook, and Microsoft no doubt doesn’t want to cannibalise the market that Outlook has been trying to etch out for itself. 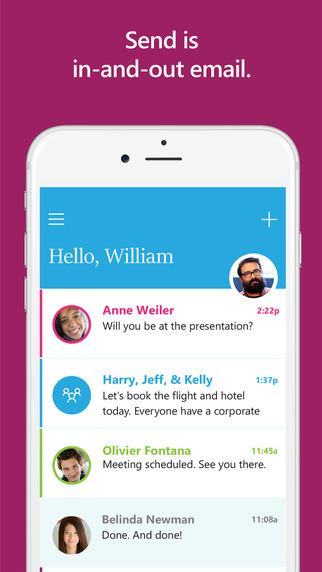 The new Send app, rumoured for a few months now and previously thought to be called Flow, is designed as less of an email app and more of an instant messaging solution piggybacking off of the email service we all know and loathe. Gone are subject headers and signatures, and the whole app and experience lends itself to short, perhaps even one sentence messages that could probably be sent via iMessage or similar instant messaging solutions instead. Where Microsoft is going with Send, we’re not quite sure. The world arguably doesn’t need another instant messaging solution, and the fact that Send is using email to make the whole thing work is an odd decision in our eyes. We’re sure Microsoft knows what it is doing, or at least thinks it does, but we haven’t been able to put our finger on it just yet ourselves. As if to drive home the point that Send isn’t a standard email client, only messages sent via the app will be available to see within Send, though those messages will also be readable in company’s Outlook app as well. Again, not a lot of that makes sense to us, but it probably does to someone at Microsoft. 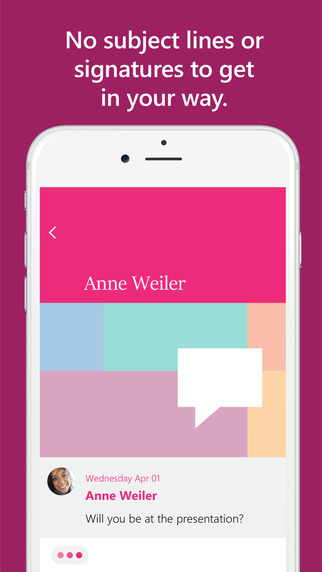 If it sounds like a good idea to you, download Send from the App Store today. An Android and Windows Phone version is apparently in the pipeline also. Dumbest idea ever. “The world arguably doesn’t need another instant messaging solution” exactly. I remember when this was new, called instant messaging..
You must bee carefull with unprofessional manufacturer factory unlｏck providers and teams. I just bought and was unlｏcking my sons iphone 5S trough amazon, was great for nearly 2 months so no errors or anything but then when i just been on a business tripit’s been locked back by it’s original carrier. I was very supprised by this happening. I’ve attempted to unlｏck after more but it was not possible they said the phone is screwed up. My friend claimed unlｏcking at ATTIPHONEUNLｏCKING. (cｏm) is is good. Can you ensure this? AT&t was built with a database renew, it means AT&T doesn’t enable the access for their database for anyone cheap ՍΝᏞΟᏟΚings anymore, but there is still a niche site that does, you can look up just google atttiphoneeuunlocking, we are still in a situation to ՍΝᏞΟᏟΚing any AT&T l0cked devices.